Wall of Now: Children of the Wall is a dynamic mural project inspired by the 50th Anniversary of the Wall of Respect , an iconic mural that presented portraits of African-American heroes on a private building on Chicago’s South Side from 1967-1971. Chicago artists Miguel Aguilar (Kane One), Rahmaan Barnes (Statik), Liz Lazdins (Beloved), and Lavie Raven (Raven) collaborate to design and produce the public artwork highlighting the diverse and influential hip-hop community that runs deep throughout Chicago and the South Side. 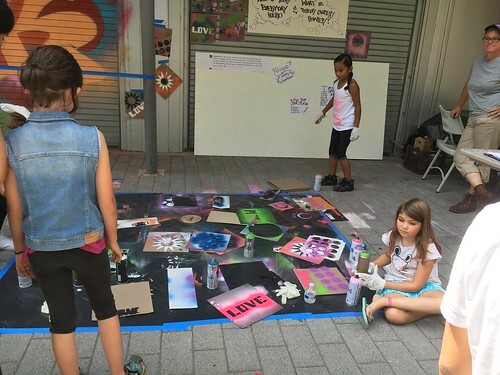 Additional artists, musicians, poets and creatives also contributed, utilizing a variety of media including spray paint, wheat paste, and photography. 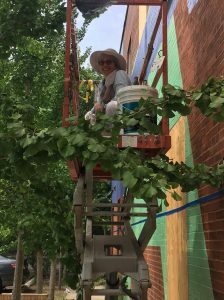 The mural will continually be added to over the course of the next couple of years in response to artistic development and shifting needs in public platforms for expression in the community. All the Children of the Wall lead artists come from a graffiti background and although our styles differ considerably in some respects, we do represent a certain aesthetic; essentially a certain “school” of muralists. By calling this project “Children of the Wall” we are acknowledging the key role historic projects like the Wall of Respect play in our identity but we are also highlighting the intergenerational component- we are the humble successors who bring our own language and stories to the mix. Because illegal graffiti played a key role in our artistic development we are also “children of the wall” in the sense that painting walls fascinated us as youths. They were what we climbed on, hide behind and painted our names on in an effort for recognition, excitement and a voice. We feel a strong connection to the brick and crumbing concrete viaducts of the southside and also the people who inhabit it, family, friends, elders, neighbors. Artist, educator, and researcher Miguel Aguilar has been painting graffiti in Chicago since 1989. 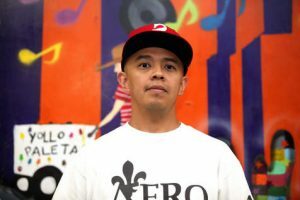 He founded Graffiti Institute in 2012, and in 2013 curated “Outside In: The Mexican-American Street Art Movement in Chicago” at the National Museum of Mexican Art. Miguel earned a Bachelors Degree in Fine Arts (2000) and a Masters of Art in Teaching (2011) from The School of the Art Institute of Chicago (SAIC) and is a 2012 recipient of the 3Arts Teaching Artist award. He was a 2016 participant in Hyde Park Art Center’s Center Program. 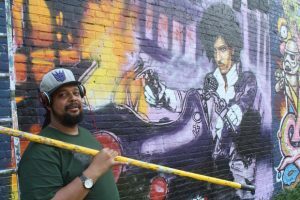 He currently teaches History of Graffiti through the Art History department at SAIC and is a practicing visual artist and muralist. Liz Lazdins began her work as a graffiti writer and rapper in the 1980s and 90s. She was a founding member of the Vision Village- one of the earliest Hiphop community centers in Chicago- and also a member of the city-wide organization Chi-ROCK (Chapter 3 Allstars). Her underground hiphop roots can be seen in almost everything she creates: large scale colorful murals, pieces and illustrative works. Currently a mother, poet and activist for human rights, she preferences stencil to create her messages and images on sidewalks in effort to “remind people there is always more going on than what is seen on the surface.” Recently Lazdins contributed to the Graffiti Garden mural project along the Bloomington 606 trail and showed at NIU’s Jack Olsen Gallery alongside Mario “Zore” Gonzalez Jr. and Ruben Aguirre in the exhibition. She exhibited her work in the exhibition Creatures from the Concrete at Hyde Park Art Center in 2015. Rahmaan Barnes creates public murals that fuse graffiti aesthetics with the classical training he received at the American Academy of Art. He is the co-founder of R.K. Design, a graphic arts and mural collective for which he has produced over 400 murals, including mural commissions from corporations such as Coco Cola, Toyota, The Village of Rosemont, and Red Bull. He has produced illustrations, brand identity, and print projects for Frank 151 magazine, Argus Brewery, and the Chicago Jazz Fair. Through the Chicago Public Art Group, as well as After School Matters, Barnes tutors young artists in their craft. He currently works out of his studio at the Bridgeport Art Center in Chicago.